As Dunster House Ltd started out as a specialist uPVC windows and doors manufacturer, we would like to think that we have been developing the best windows and doors in the market for our garden buildings. Our PremiumPlus Windows and Doors has been developed over a number of years to provide our customers with the best and most secure option available when purchasing a Dunster House Garden Building. We use 4mm toughened glass in our windows and doors, for increased security and resilience. It's better than 3mm hortiultural glass which is commonly found in garden buildings, as it's much harder to break, as well as being much more scratch resistant than any of the plastic alternatives such as Styrene, Perspex or Acrylic. We also offer optional double glazing. Our PremiumPlus double glazed units use 24mm glass, which offers a greater thermal efficiency. Regardless of the thickness, all of our double glazed sealed units are manufactured to European Standard EN1279 to prevent condensation between panes. 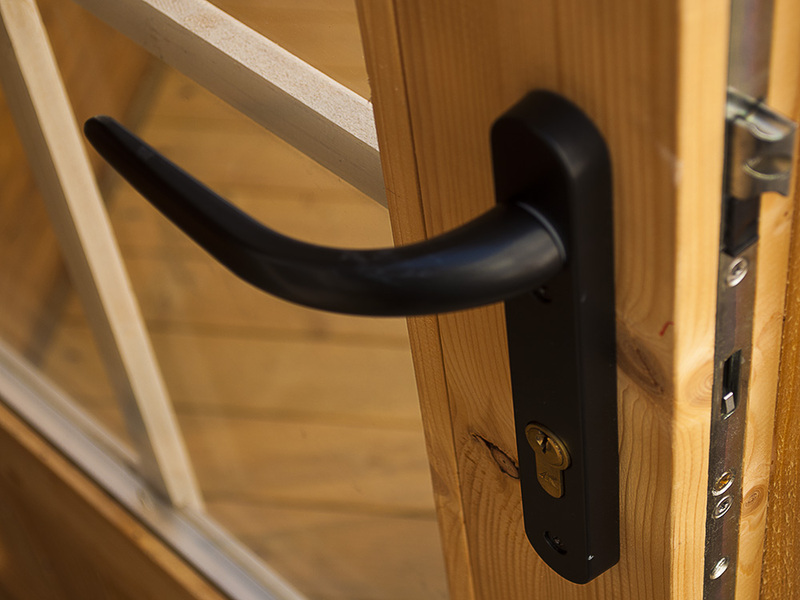 Our PremiumPlus Windows and Doors use domestic grade multi-point locking mechanisms, giving you peace of mind when leaving valuables in your garden building. This includes domestic style metal handles, similar to what you have in your home, and gasket seals which add to the weatherproofing of your garden building. Our Premiumplus windows and doors are jam packed with features! PremiumPlus Doors use four different locking points to give you maximum security, including a locking catch, hook bolt and two opposing cams. The opposing cams move in opposite directions, locking the master door to the slave door, preventing the door from being lifted out of the locked position, whilst the hook bolt holds the two doors together in the other direction preventing them from being pried apart. This is combined with a 6pin Euro cylinder, the same type of lock barrel you would find on a modern domestic door, and just what most insurance companies ask for. Easy-Adjust hinges are used for our PremiumPlus doors. They allow adjustments to be made by rotating the hinges in and out of the timber on either the sash or the frame, so hanging the doors in the first place is a breeze and you can easily adjust them in future if you need to.The long lengths of timber in the sides of the door sashes and in the sides of our long windows are made using laminated timber to help reduce bowing. Our PremiumPlus Windows also feature a multi point locking system, with mushroom headed espagnolette locks. It sounds like an appealing pasta dish but, once the espagnolette locks engage with the keeps it makes it harder for the windows to be forced open as they hook underneath the edge of the keeps. 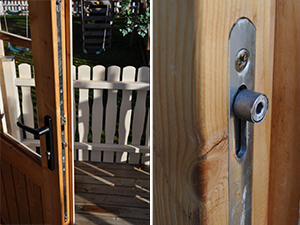 This is an advantage over the simple roller cam system that can be found on some other garden buildings windows, and serves a similar purpose to the hookbolt we feature on our door locks. The windows also have anti-jemmy riser blocks fitted, these will prevent the windows from being forced open by somebody simply pushing the sash sideways and disengaging the locks, similar to the function of the opposing cams on the door lock. There's no need to worry about the PremiumPlus windows moving about in the wind either as they are fitted on domestic friction stays. So, you can open your window and the friction stay will hold it open, just like uPVC windows in most homes. Giving you a window that is far more usable on windy days when you just want to quickly open it up and let the fresh air in. Our PremiumPlus windows are outward opening, which is perfect for the UK as we like to hang blinds and curtains on the inside of our buildings to add privacy and protect us from the sun's glare. Made from high quality Spruce timber our windows and doors all feature internal beading to allow you to easily remove the glass from the inside of the cabin, should it ever break and you need to replace it, but since the beads are on the inside of the cabin no intruder will be able to do so from the outside of the cabin. It'll make breaking into your garden building more difficult, but gives you the flexibility to replace the glass easily should ever you need to do so. Another security step we've taken on all of our windows and doors is that the entire frames can be easily removed from the inside of the building as the U-channel of timber which holds them in place is screwed into place on the inner trims, but glued into place on the outside. So should ever you need to replace a window or door in years to come, or if you want to add a window or door into a cabin wall you can do so quite simply by unscrewing those internal trims, putting the window or door into place and then screwing them back on again. Importantly of course, the same cannot be done from the outside of the building. Our PremiumPlus Doors are just as secure as those you have at home, don't let the lower panel with its attractive tongue and groove effect fool you. This panel will not have gaps appear in the same way as a normal log cabin door would. PremiumPlus Doors use four different locking points to give you maximum security, including a locking catch, hook bolt and two opposing cams. The opposing cams move in opposite directions, locking the master door to the slave door, preventing the door from simply being lifted out of the locked position. This is combined with a 6pin Euro cylinder, the same type of lock barrel you would find on a modern domestic door. Heavy Duty Easy-Adjust hinges are used for our doors. They allow adjustments to be made with an allen key, without the need to remove the sash.